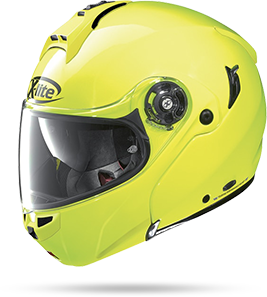 X-Lite's new flip-up helmet which maintains and enriches the much-appreciated technical characteristics of its predecessor, the X-1003. Its compact volume(thanks to the availability of three outer shell sizes), double P/J homologation, VPS sunscreen, efficient TVS Touring Ventilation System, exclusive Dual Action chin guard opening mechanism, Microlock® double-lever retention system with adjustment, Touring Performance Unitherm inner comfort padding(with an innovative net construction) and N-com X-Series communication system (ready for) make the X-1004 a reference-point flip up helmet for the most demanding of motorbike tourists. • The helmet can be used either with the chin guard open(J configuration) or closed (P configuration), as the protective chin guard has passed the homologation tests required by UN/ECE regulations for full-face helmets. • Pinlock® Fog resistant inner visor supplied and with a silicone sealed profile. • VPS Sunscreen with UV 400 protection. Positioned on the inside of the helmet, it is molded out of LEXAN™ and is S/R (scratch resistant) and F/R (fog resistant) treated with UV protection up to 400 nanometres. It is easy to remove when it is needed or for normal maintenance and cleaning operations. • TVS (touring ventilation system) The system is made up of: an upper air intake that provides both direct ventilation to the front of the helmet (even at low speeds and independent to the position of the VPS) and diffused ventilation to the upper-head area in combination with the innovative net featuring the liner. A chin guard air intake that allows ventilation at mouth level and directs air straight to the visor, limiting fogging. A rear extractor integrated into a rear spoiler, it allows for the expulsion of hot, stale air. • Microlock® Double lever retention system with micrometric adjustment. This system consists of a thermoplastic ergonomic opening lever, and of second aluminum toothed and holding lever. • Dual Action chin guard opening system. Positioned in the center of the chin guard, it allows for easy one handed opening. • Removable Liner with Innovative Net Construction. This assists the movement of air around the upper part of the head, which thus stays cool and dry. • Eye wear adaptive. Exclusive system designed for the comfort of eyeglass wearers. It allows space in the cheek pads for the glasses temples. • Integrated Chin Straps. Removable and washable, they are integrated in the cheek pads, favoring the helmets fit, as well as its wear ability. • Wear ability. Compared to its predecessor (the X-1003 model) the X-1004 has improved wear ability in the chin area: the chin guard has been slightly elongated to offer ease of wear.